One British WW2 15 cwt truck in 6mm or 1:285 scale. One British WW2 3 ton CMT truck in 6mm or 1:285 scale. One British WW2 Archer tank destroyer in 6mm or 1:285 scale. One British Bedford QLD cargo truck in 6mm or 1:285 scale. One British Bedford QLT troop carrier in 6mm or 1:285 scale. One British Bren carrier No. 2 Mk I in 6mm or 1:285 scale. One British WW2 Churchill AVRE tank in 6mm or 1:285 scale. One British WW2 Churchill Crocodile flame tank in 6mm or 1:285 scale. One British WW2 Churchill I tank in 6mm or 1:1285 scale. One British WW2 Churchill II tank in 6mm or 1:285 scale. 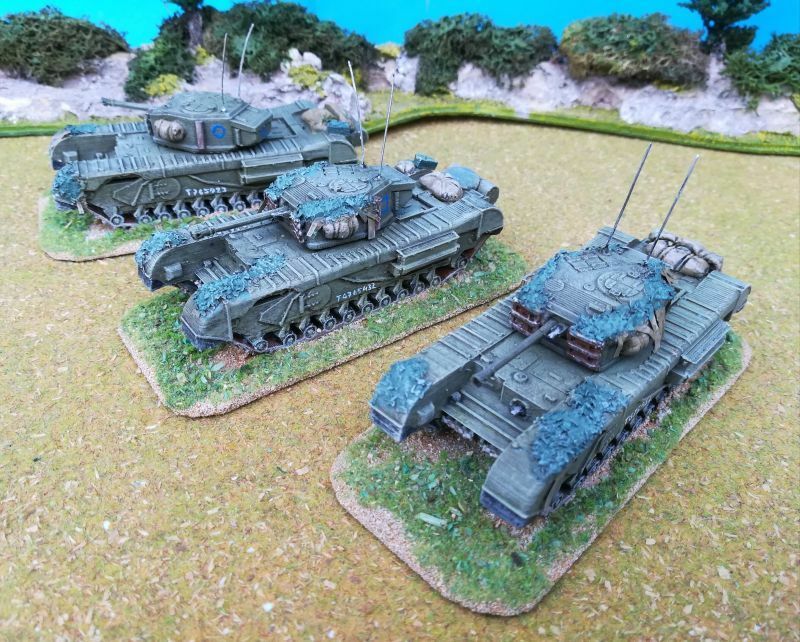 One British WW2 Churchill IICS (Close Support) tank in 6mm or 1:285 scale.